Malcolm Young co-founder of AC/DC describes Phil Rudd as "the real deal"
Drumming peers from Kenny Aronoff (drummer for John Mellencamp) describes him as "the rock drummer" to Eric Singer of Kiss singing Phil Rudd's praises "the heart and soul of AC/DC." Over the next four years Rudd powered the band to superstardom with his dogged consistency and unshakeable backbeat on classics like "It's A Long Way To The Top (If You Want To Rock 'N' Roll)" "T.N.T" and "Dirty Deeds Done Dirt Cheap." Phil Rudd is an indelible part of AC/DC history. Rudd said he 'went straight down the road to buy my first Ferrari' after the block busting epic album Highway to Hell went multi-platinum Worldwide. To the inexperienced, Phil Rudd's drumming may seem rudimentary. But his unselfish style and humongous groove have earned him the adoration of generations of drummers. Rammstein's Christoph Schneider said in the October 2010 Modern Drummer, "AC/DC were my absolute heroes because they are simple and easy to copy—though soon you find they are not so easy to copy." The magazine's May 2010 issue also chimed in on the timeless rocker with the feature "50 Reasons To Love Phil Rudd "The veteran musician has appeared on all but three of AC/DC's 18 studio albums, which have sold more than 200 million copies worldwide. 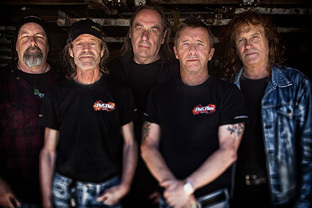 "You couldn't find a more solid person or drummer than Phil Rudd" said ex lead AC/DC vocalist Brian Johnson Phil Rudd during 2014 recorded and released his first debut album Head Job with Kiwi musicians Allan Badger and Geoffrey Martin . The release of Head Job via Universal Music Group only took place in Australia & New Zealand. "I couldn't be bloody happier with Head Job, to tell you the truth" Phil told Libel Music. "I'm so proud of the album, everything I had to do with it. The guys played really well on it, it's just too good. Really great, mate... I'm pretty happy with the drum sound"
All enquiries worldwide exclusively here at Fizzion.